Waters did not respond to either request. These emailed solicitations from White Helmets representatives and activists were provided by Waters to the Grayzone Project, and are published in full at the bottom of this article. The documents demonstrate how the organization’s well-funded public relations apparatus has targeted celebrities as the key to the hearts and minds of the broader Western public. Unlike many other A-listers, however, Waters took time to research the White Helmets and investigate its ulterior agenda. The October 2016 dinner invite was delivered to Waters by a representative for the Corniche Group, an international holding company belonging to the family of the London-based Saudi billionaire Hani Farsi. Farsi was seeking Waters’ presence at a fundraising dinner he had organized on behalf of The Syria Campaign. The Syria Campaign is a well-funded public relations front established to promote The White Helmets as a group of heroic rescuers who require the protection of Western militaries. Through series of petitions and public demonstrations, The Syria Campaign has unsuccessfully pushed for a No Fly Zone in Syria that would have likely resulted in the kind of Western military intervention that toppled Libyan President Moammar Qaddafi and destabilized Libya. The slick PR firm has also resorted to astroturfed public stunts like a pro-White Helmets flash mob and orchestral performance at New York City’s Grand Central Station where participants were paid up to $600 each. Farsi’s relationship to the The Syria Campaign had been kept private until now. A Syrian-British oil tycoon named Ayman Asfari has taken a much more vocal role with the PR group, providing it with seed money to advance his mission to stimulate US and UK support for regime change in Syria. Waters was informed that Asfari’s wife, Sawsan, would be on hand for the 2016 White Helmets fundraising dinner. Over the past two years, The Syria Campaign has secured endorsements of the White Helmets’ work from actors including George Clooney, Aziz Ansari, Ben Affleck, and pop stars like Coldplay and Justin Timberlake. The Syria Campaign also helped orchestrate the production of an Oscar-winning Netflix documentary about the White Helmets in 2017. In the email to Waters, a Corniche Group staffer urged the singer to watch that film and provided him with a link to its trailer. Waters said he also concluded that The Syria Campaign — the PR firm behind the White Helmets — was not simply the humanitarian voice it purported to be, but a corporate outfit that represented much more prosaic interests. The Syria Campaign’s top funder, Asfari, was described by the UK Independent as one of the “super rich” Syrian exiles poised to oversee the rebuilding of the country if Assad were removed, and to presumably reap lucrative contracts in the process. In its invite to Waters, The Syria Campaign presented him with links to articles that read like press releases for the White Helmets: one from Time Magazine and another by The Guardian urging the Nobel Prize committee to honor the organization with its highest award. The Syrian Campaign appeared to be taking credit for generating both pieces. The reality of the White Helmets is much more disturbing than its hired PR guns have cared to admit. Not only have the White Helmets operated exclusively alongside Islamist extremist insurgents, including the local Al Qaeda affiliate Jabhat al-Nusra and ISIS, its members have participated in several documented public executions, and helped extremists dispose of beheaded corpses of those they’ve killed. Unable to discount the documented facts about the White Helmets’ ties to jihadist insurgents, The Syria Campaign published a lengthy report last year dismissing all critical reporting about the organization as the result of a vast Kremlin-directed conspiracy. In fact, since the White Helmets were founded in Turkey by a former British MI5 officer named James Le Mesurier, the group has received at least $55 million from the British Foreign Office, $23 million or more from the United States Agency for International Development’s Office of Transition Initiatives — the State Department’s de facto regime change arm — and untold millions from the Kingdom of Qatar, which has also backed an assortment of extremist groups in Syria including Al Qaeda. “We have our own intelligence.” With little else to offer, she was likely referring to social media material published by members of the White Helmets. In the days leading up to Waters’ April 13 concert in Barcelona, an assistant received an email from a French photojournalist named Pascal Hanrion who described himself as “a militant with the syrian white helmets to denounce crimes against humanity in syria,” and part of a “very powerfull [sic] syrian network.” Unlike the corporate PR professionals of The Syria Campaign, Hanrion appeared to be a freelance activist. Back in July, 2016, Hanrion ran a marathon-style race through the Swiss Alps wearing a white helmet presented to him as a gift by rescue workers from the town of Jisr al-Shugour, which is located in the Al Qaeda-controlled Syrian providence of Idlib. According to journalist Jenan Moussa, the homes of original Jisr al-Shugour residents have been handed over by Al Qaeda’s local affiliate to Chinese Uighur jihadists and their families. 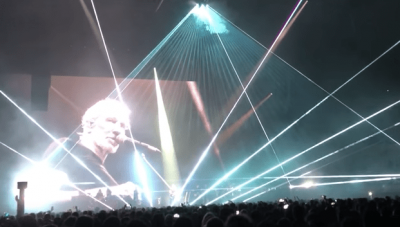 Instead of allowing the eccentric activist on stage, Waters delivered a message of his own, urging his audience to deconstruct the wall of pro-war narratives brick-by-brick. See White Helmets Emails to Roger Waters by Max Blumenthal on Scribd.